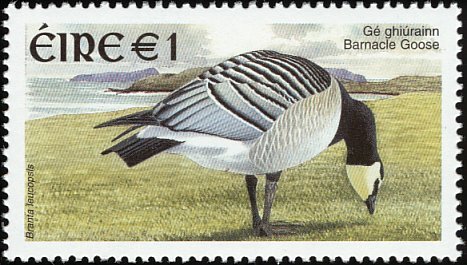 But of all the calls borne on the winds of Duvillaun, the one with a special resonance for David Cabot and me was the guttural flight-chatter of barnacle geese, the birds we have twice pursued to their breeding cliffs in Greenland. The little groups that circled : the island and roosted briefly at its boggy ponds were part of a great influx to the barnacles' main wintering-grounds on nearby Inishkea. When, at length, we had finished filming Duvillaun's grey seals and could escape between gales in the rubber dinghy, our own arrival at Inishkea stirred the geese up in huge, gabbling flocks that left us awed by their numbers. The birds were nervous and restless, exploding into flight at our slightest approach and sweeping in long trains from one end of the island to the other: almost two thousand birds in the air at once . It seemed obvious that the geese had been shot at in Iceland on their way south - the one chink in their protection across the whole of their range. They clumped together in the island fields and were bad-tempered with each other, hissing and squabbling. In his 28 years . of studying them, David had rarely seen such numbers arriving together - encouraged, perhaps, by the recent north-westerly gale - but he had rarely found them so difficult, either, to stalk with his telescope, looking for rings. The equinoctial gales have always made autumn visits to Iniskea an uncertain business, which is why, perhaps, the passage flight of migrants has so seldom been closely noticed. Not alone the barnacles, but pink-footed and Greenland white-fronted geese. came by, and flocks of snow buntings and skylarks, meadow pipits and snipe. But the most unexpected birds that dropped in on the morning of an easterly gale - two: tiny goldcrests, with a merlin in hot pursuit. Finding no trees to shelter in, they dived among the stones of the ruined village until the hawk had moved on. "If such be the customary produce of their stills, those islanders are worthy ofbeing canonised'' . "Here the still is considered a valuable heirloom in a family and descends in due succession from father to son. When not in use, it is lowered by a rope into one of the deep caverns with which the western face of the island abounds''. Poitín competed with fishing and farming as a source of income to the islanders. They sold it on the mainland and many would claim that their best customers were clergymen - of both persuasions - and policemen. As we already know they had a ready market for it as far away as Achill. An islander and his daughter were lost on their way there with a load of ponton in 1898, as a result of which 3 policemen were again stationed on the island. This made the trade more difficult, but not, I would think, impossible. We are indebted to the archaeologist Mlle. Francoise Henry for the knowledge we have about the ancient remains on the islands. She carried out excavations in Inishkea in 1937-38, and again in the early fifties. 1 More than a hundred years before that, Dean Lyons had excavated one of a group of graves there, and found a skeleton buried with the mouth turned under. 2 Unfortunately, over the years, some damage was done by treasure-hunters. Mlle. Henry's was the first excavation done systematically in Ireland in an early Christian monastery of the beehive type. Her finds show that there was very little difference between the ways of life in ecclesiastical and lay settlements. Inishkea was always a desirable place to live because of the good lands and fishing, and this explains the enormous quantity of remains - megalithic, bronze age and Christian. On South lrlishkea there is a tall cross-slab with an elaborate design, south of the harbour. North of the harbour there are two concentric circles of small stones with a cross-pillar in the centre and to the west the foundations of a small church. At Port a' Leachta there is a holy well dedicated to St. Deirbhle. A heap of white stones gives it the name Port a' Leachta. The monastery on Inishkea probably lasted until the Viking raids. The Vikings attacked Burrishoole in 811 and built a stronghold in Inis Coitil around that time. There is evidence that Inishmurray was sacked in 807. 6 There is no proof that they ever raided Inishkea, but from a scientific study of ashes and other remains on the island, it appears that Inishkea was abandoned for a period coinciding with the Danish occupation of Inishmurray. Although there was an element of truth in these remarks, the people of lnishkea were no more heathen than their neighbours in the Mullet or throughout Ireland. As we know, religion here at that time was a strange mixture of Catholic worship and old pagan customs and superstition. The idol referred to wag the Naomhóg, a small stone figure of unknown origin, much revered by the islanders and credited with supernatural pawers. They claimed it was equally powerful in calming a tempest when their own boats were at sea, or raising one to bring them a wreck when a ship passed close by the island. "On return to the house in which it had been lodged, it way warmed at the fire, and put into the comfortable bed allotted to it 11". It was dressed in a new suit of homespun flannel every year and the islanders claimed that when the old suit was removed it looked quite worn out. When Fr. O'Reilly was a curate here at the end of the nineteenth century, he threw the Naomhög into the sea. He died a short time later. The islanders were quite convinced that his death was the direct result of his destruction of the Naomhög. Shand's statement that the islanders paid no rates was indeed true. It was well known that the collection of rent or rates on any of the islands of the Mullet was a difficult and dangerous task. Rate collectors refused to go to the islands because the islanders stoned them to prevent them from landing and no boat owner on the mainland would risk his boat by taking them there. 13 Alice Bruun, daughter of Lorentz Bruun, the whaler, saw a rate collector being stoned in 1913. Even an escorting gun-boat had once been smashed to pieces at lnishkea. The members of the Board of Belmullet Union were very aggrieved about this. For a period of at least fifty years. spanning the end of the 19th century and the beginning of the 20th, expectant mothers from the islands constituted the largest number of patients in the workhouse infirmary. Due to weather conditions they would sometimes spend weeks, even months there. This was at the expense of the people on the mainland. who paid rates. For much of that time the people of Inishkea were in more comfortable circumstances than those on the mainland. From 1908 they had wages from the whaling station and in 1913 alone lobsters brought in more than £2,000. The members of the Board contemplated drastic measures such as sending a large boat escorted by police in a gun-boat, to distrain the islanders' animals, or to take out warrants against them for the next fair-day, when they would have their animals in town. It was also suggested that the women of Inishkea should be refused entry to the infirmary unless the rates were paid. 13 I don't think this threat was ever carried out. As for collecting rates on lnishkea, the collectors had been defeated in their purpose by the islanders so often that at last they gave up trying. A couple of the islanders did pay rates and on the rare occasions when the collectors succeeded in landing and capturing an animal, the owner simply pointed to one of the rate payers and said, "that's his, not mine''. Frequently, if the islanders saw the posse coming in good time, every animal on the south island was driven into the coves and caves of the west coast, where no stranger would ever find them. The good bed-clothes and other valuables were bundled into bags and carried there too. When the collectors arrived they found the beds covered with old sacks and the fields empty. These measures were unnecessary on the north island, where there was no pier. The bailiff and his helpers were free to collect the cattle and drive them to the beach, but they then had to load them onto the boats - which were out in deep water. Surrounded by hostile islanders this was an impossible task. 2 Perhaps Shand was not so wrong after all. The people of lnishkea also slept on feather ticks while the majority of the people of Erris slept on straw or rushes. Immense quantities of sea-fowl feathers were collected annually on Black Rock, where the birds were so tame that all that was required for their capture was a long stick to knock them from the rock ledges into the boats. The island also afforded excellent pasturage for sheep, so there was an abundance of timber, feathers and wool to enable the inhabitants to live in comfort. "Throughout the greater portion of the winter all communication with the mainland is interrupted. The sick must die without relief and the sinner pass to his account without the consolation of religion. Should anything beyond the produce of the islands be requisite in the stormy months, it must be procured with imminent danged and constant loss of llfe and property forms the unhappy theme of the tales and traditions of this insulated people " 15. Their isolation also affected the education of their children. The first official school to open there was in 1886 - on Inishkea South. For eight years the children from the north island were ferried to school each day in currachs, until a school was opened on Inishkea North in 1894. That is not to say that the people of lnishkea were uneducated until schools were built there. As had happened on the Mullet itself, many castaways and refugees took up residence there down through the centuries, and some of these undertook to teach the basics at least to adults and children on the islands. The people themselves were eager for education. There had been a school of sorts there for some years before the official school opened. In 1879 three men from Inishkea applied to the workhouse to have Thomas O'Malley, a young boy who was an inmate there, sent to Inishkea to teach their children, at a salary of £4-15-0 per annum. There was a slight problem - the boy had no clothes. The Board of Guardians presented him with a new suit and he became a teacher in Inishkea. During the first decade of the twentieth century, the purchase of the islands by the C.D.B. from the landlord, John Walshe, wrought many changes there and brought increased prosperity to the islanders. Early in 1908 while the improvements to holdings and homes were in progress the C.D.B. sold a four and an half acre site on Inishkea South to the Arranmore Whaling Co. for £100. This was on the tidal islet of Rusheen. The first choice of the Whaling Co. had been Aranmore Island, off the coast of Donegal, but so many objections were raised on the mainland there, particularly by fishermen, that the Arranmore Co. was refused a permit. Almost immediately it was announced that the company had bought a site on Inishkea and would set up its operation there. Rev. Spotswood Greene, a member of the C.D.B. and Inspector of Fisheries, was probably influential in bringing this about. He felt that much of the criticism of whaling was ill-informed, and as a member of the C.D.B. he was eager to bring employment to remote places like Inishkea. Four men lived on Rusheen when it was sold and they were paid a rent of £8 annually for their goodwill, although they did not own the land. The members of the Whaling Co. were all Norwegians - L.M. Christensen and Erling Lund being the chief shareholders. The resident overseer was Captain Arff Petersen, who used an ear-trumpet. The people of Inishkea were fascinated by this and referred to it as a "teapot". Building began immediately. A load of timber was brought in on the "Alecto'' which had been waiting to unload at Aranmore, when the Company's plans were changed and it was redirected to Inishkea. A flensing plane with a slipway running down to low water and a 400ft pier were constructed. There were large sheds, one beside the plane, containing boilers and another housing two dryers, which were used to desiccate the meat and bone for production of cattle food, artificial manure and bone meal. There was a mill for crushing bones, also storage tanks for oil and other products, a cooperage; a forge; quarters for the men; a fire-house with boilers for steam, and an administrative building for the manager. A new whaling steamer - the "Erling'' was purchased. There was a second steamer, the "Carsten Bruun'', owned by Lorentz Bruun, who owned a small number of shares in the Company but took no part in its direction. He was first harpooner on his ship, a crack shot, and he simply caught whales and sold them to the Company. The following year, in 1909, he left and set up his own company - The Blacksod Whaling Co., at Feorinyeeo Bay on the south side of Ardelly Point on the Mullet. The products were shipped to Bowling in Scotland, first by small tramp steamers to Westport or Sligo and sent from there, or put on the whaling ships on their return to Norway when the season finished in September - to be dropped off by them at Bowling. Nordcapers were the first catch. They are scarce animals which hug the coast when passing. Unfortunately for them they were doing just that when the fishing started in 1908. Blue whales, fin whales, sei and right whales were also caught. The weather was poor that year. so the operation was intermittent. The total catch was 77 whales, most of which were taken within ten miles of the station. No sperm whales were caught that year - they are a deep-water species. In 1909 the steamers had to go about 60 miles to catch whales. That was the best season the Company had - 102 whales were landed. But apparently the opponents of whaling were wrong about its detrimental effects on fishing. Mackerel, cod and white fish were taken in the vicinity, and in 1909 the lobster fishing was the best for many years. Sadly the enterprise was a failure - "plagued by circumstance and an extortionate work force ashore'' . It was beset by problems from the start. The site, however cheap, was unsuitable. It was possible to bring a whale up the slip for only 2 hours on either side of high water - 8 hours out of 24. It was important to flense the whales as soon as possible after death to avoid spillage and seepage of oil. For the same reason coaling was difficult. Coal was essential as a fuel for the catching vessels and the station machinery and had to be pushed by hand in flat topped wagons on a tramway which ran along the pier from the buildings. Sometimes barrels were transported between ship and shore on rafts. But the greatest problem of all was with the islanders. Isolated as it was on a small and remote island, the company was completely at their mercy. From the beginning they refused to allow the employment of anyone from the mainland or even from the north island. Between 26 and 40 hands were employed - depending on the amount of work but the Company found them indolent and unreliable. There were understandable reasons for this perhaps. Never having been in employment before they did not seem to appreciate that they were committed to regular attendance. When somebody died on the island the entire work-force was absent for three days - the duration of the wake, while whales deteriorated at Rusheen. There was, possibly, a more compelling reason still. When the lobster season started two men in a currach could make £20 a week. It was tempting to opt for this rather than work at the station - and undoubtedly many yielded to the temptation. Indeed, while the lobster season lasted some of the islanders were paying men from the mainland one shilling (5p) a day to dig their potatoes. The lobster pots were set close in all around Inishkea South except for a fairway for the steamers at Rusheen. The workers were being paid 15/- (75p) a week - for doing very little, according to Christensen. That was a good wage at that time, but they went on strike at the height of the season in August 1909. The Company was at their mercy and had to raise the wage to f1. Workers who became ill were paid full wages until they recovered. On one occasion when an unusually large number of whales had been brought in, it was necessary to keep all who were willing, working overtime. Shamelessly the sick men arose from their beds and demanded overtime too. The king of the island, a man named O'Donnell, was the foreman and time-keeper. Miss Alice Bruun, Captain Bruun's daughter, on a visit to the island in 1913 met the queen and remembered that her house had floor boards, while the other houses had earthen floors. L.M. Christensen was not satisfied with O'Donnell and at the end of the 1909 season begged Rev. Spotswood Greene to use his influence with the C.D.B. to have him replaced. The result was not recorded. O'Donnell was not a native of Inishkea. He had come from Roundstone for the lobster fishing and settled there. Strangely the king of Inishkea North at that time, Philip Mór Lavelle, was not a native of Inishkea either - he had come from Inish Bofin and stayed. Shortage of fresh water at the station was another problem in 1909. Water had been piped from a storage tank on the land of a local man. For that part of his land he received twice the rent of his total holding. This was not sufficient for the needs of the station and Christensen tried to negotiate the building of a second reservoir with a neighbouring landowner. Agreement was forthcoming, but when it became evident that an exorbitant rent was being demanded, Christensen asked Rev. Greene for permission to sink a well in part of the land still in the possession of the C.D.B.. The result of these negotiations was not recorded, but there are concrete dams across the two main streams of lnishkea to this day. So the islands were left to the birds and the seals, the grazing animals, occasional bird watchers, and in Summer the day trippers. Some of the boat- men on the mainland contribute to our developing tourist industry by taking groups to the islands during the Summer months. The seals surface to have a look at the visitors and watch curiously as they wander through the abandoned homes and the roofless school, or picnic on the beach. A visit there is a moving experience - a reminder of the generations who lived there and are now no more. It is odd to see a bed one has slept on recorded as a piece of social history, but there it is on the page, its planks rotted and caved in at last. I can feel the damp in the crumbling plater of the wall, smell the acrid ooze of soot. The sounds of those nights on the island dome back, too. On the calm and starry ones, a soothing furl of waves on the white sand beyond the door; geese calling softly as their flights skimmed the chimney. And on fierce nights in January, storm gusts booming and shuddering in a roof welded from tin and concrete, firelight flickering wildly on the spars slung beneath the rafters. 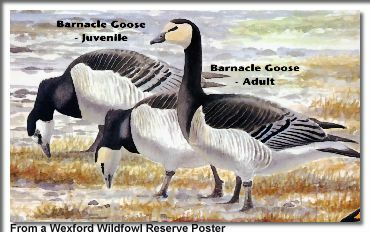 That was in the 1980s, when I was helping David Cabot in his lifelong study - 40 years this winter - of the great winter flocks of barnacle geese. An empty fisherman's cottage was our shelter and I pick it out now in the photographs and maps of The Inishkeas in Mayo's Lost Is lands, by Brian Dornan, just published by Four Courts Press. Not much seems to have changed. The sand has sifted further in across the hearths of the houses, deserted since the l 930s, and thickets of nettles spread out from their walls. Ruined gables still make a spiky frieze on the lee shores of the islands, north and south, and storm-waves still seethe across at the weak spots. As sea level rises, the ocean will finish the job of carving the Inishkeas into an archipelago. It is impossible to wander the grassed-over lazybeds and cliff-tops in winter and not wonder what the islands were like ln their heyday, when 60 whitewashed cabins held more than 300 people in something close to self-sufficiency. Brian Dornan, archaeologist turned local historian, has researched the past 100 years of the Inishkea community and, in his study of its families, gives scholarly shape to an extraordinary human saga. The Blaskets and Aran have had such gifted chroniclers thàt they have dominated the story of the western islands. The Inlshkeas lack this kind of witness, and the robust glimpses in William Maxwell's Wild Sports of the West of 1832 are merely tantalizing. Dornan has gone to the quill-wrltten files, the oral folklore records In Irish, the reminiscences of islanders ashore, and what he puts together makes one ache for the indigenous voice of a Peig or a Liam O'Flaherty. Now that we have absorbed the revisionism of scholars such as Kevln Wllelan, it comes as no great surprise to find that the modern settlement of the Inishkeas dates only from the late 1700s. That leaves a big gap between them and the medieval monks and early Chnstian people who minced up dog whelks to make imperial purple dye for an upmarket trade. The idea that remote western villages and islands might hold some kind of continuity with an aboriginal Celtic landscape, and traditions enduring from prehistoric tames, seems finallyto have died with Estyn Evans, a great but romantic geographer. What took the later human settlement further and further west was population pressure and good natural resources: seaweed, fish, good island grass - also, in the case of the Inlshkeas, the chance to make illicit poitín from barley,with a clear view of any boat approaching. Rather like Whelan's coastal communities in Connemara, the Inishkea settlers entered the 19th century with a healthy cash economy and plenty of bacon smoking in the rafters at Christmas. 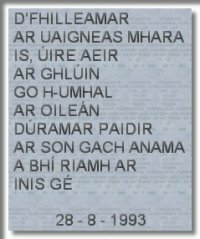 From early on, they were a hard bunch, ruled by their own rí or. king, rather than their distant Catholic landlords. In the Famine years they took up serious piracy, subduing the crews of becalmed cargo luggers with volleys of stones and hijacking their loads of flour and meal. While the rest of the Mullet region was ravaged by the Famine, the population the Islands went on rising. Piracy and poitín brought resident coastguards and three RIC constables (a posting even worse than Belmullet). The piracy stopped but the stills kept working, hidden on ropes down sea caverns between brews. The Inishkeas were still notorious for poitín when Norwegians jet up a whaling station there early this century, and the idiosyncrasies of the south islanders (who wouldn't, for example, let their neighbours from the north island anywhere near the jobs on offer) helped sink the whole venture ln a reek of rotting blubber. Their intractable independence and its slow subversion after the Famine is one of Brian Dornan's central themes; in an age in which the landlord and the priest form the twin foci of the land war and the devotional revolution, Inishkea seems to have held neither in high regard.. Their do-it- yourself religion, remote from churches, found bizarre expression in a famous veneration in the namhóg, a two-foot totem stone, with power over the sea, secreted in a wrapping of red flannel in a niche in one of the houses. This blank and enigmatic slab, which may have been salvaged from among the island's many Early Chnstian antiquities, figured in T.H. White's Mayo memoir, The Godstone and The Blackymor. Here Dornan ties up a few more fascinating loose ends in as full an account as we are likely now to get. The godstone, alas, did not survive to calm the sudden storm of 1927 that drowned a dozen young fishermen: a tragedy that broke the islands' spirit. The sea, as one might expect, dominates much of the folklore. The ceaseless ocean swell had its own name, the fág, and , there ls careful information on the sequence of waves to watch at a currach's launching. The technology of making light with oil from dogfish livers, or candles l from rushes and sheep-fat, suggests other sorts of challenge that should really have faced the recent television "castaways". Wildlife gets brief, utilitarian shrift in Dornan's siftings. Birds fly in only as pests in the barley crop or to provide feathers for mattresses. Seal oil, too precious to burn in lamps was a healing rub for rheumatism. No hint there of the hundreds of grey seals that breed around the Iniskeas today, or the 2,500 barnacle geese that sojourn there from October to April Exit the ghost of the Congested Distncts Board; enter the Special Area of Conservation.